Let’s face it, Game of Thrones is probably one of the most addictive substances on the planet. Even if white walkers and dragons strike you as a bit lame at first, it’s inescapable that all your friends are into it. It’s hard not to get sucked in. And when you do, you’re hooked – you’ve just got to get your next fix, by whatever means necessary, even if that means entering the murky underworld of content piracy. Like many addictions, there’s a string of unseen victims experiencing the domino effect of the habit – a habit that reaches far beyond Game of Thrones. It’s not only broadcasters and cinemas paying the price of the knock-on effect of content piracy, it’s the creators, cast, crew, producers and distributors too. 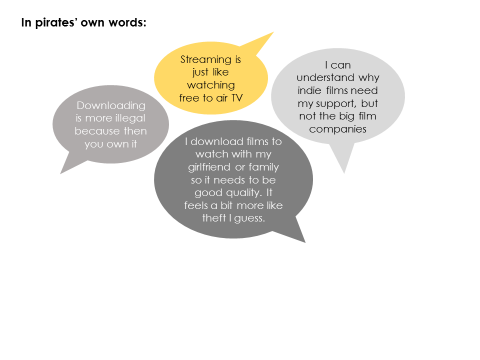 So why has piracy become so prevalent that as many as 1 in 3 adult Australians engage in it? What goes on in the mind of a pirate? And how do we change it? 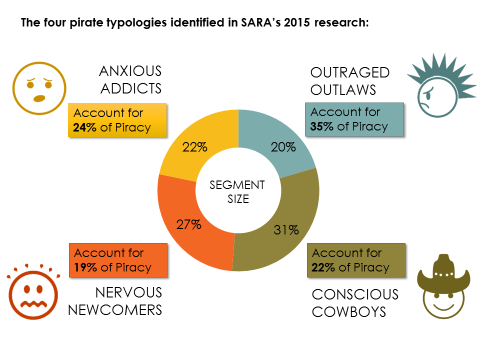 Screen Audience Research Australia (SARA) conducted two waves of research in 2015 and 2016, delving into the minds of content pirates and exploring what it would take to change their behaviour. Universally, content pirates know that what they’re doing is wrong or, at the very least, not exactly legit. An internal, self-justifying monologue more often than not concludes with the central tenet “I’m not hurting anyone”. But in depicting a ‘typical’ pirate, broad brushstrokes are insufficient. It’s an underworld inhabited by a complex ecosystem of ‘dealers’ and ‘users’, where a culture of fear has worked to give rise to different attitudes and user ‘types’. Research by SARA in 2015 identified 4 broad attitudinal segments. Nervous Newcomers are those still at the gateway; they fear retribution and dabble around the fringes, maybe with friends providing the gear. Some will progress to become Anxious Addicts, for whom the fear of detection never really goes away but the addiction takes hold and they find themselves doing it more and more. Conscious Cowboys feel guilty about their actions but their love of content spurs them on. Outraged Outlaws believe that content should be freely available to everyone and that an ‘unfair’ distribution system (as they perceive it) doesn’t warrant paying for. In addition to these attitudinal segments is a layer of behavioural complexity, in which a gradated scale of ‘wrongness’ is perceived. Streaming TV shows is at the softer, gateway-end of the spectrum; it’s only for personal use and there’s no ‘possession’, so it’s not equated with stealing. Downloading TV shows is worse because intent to supply is intrinsic to the mechanism, but yet TV is a mass broadcast medium: it’s something that’s perceived to be “already out there” and everyone involved is believed to have had their payday. Downloading movies is the really hard stuff; movies aren’t just given away for free so it’s hard to claim it’s not stealing but, even then, you didn’t rip it from its source, those people are the real pushers. Pirating Australian content does prick the odd conscience but American content is considered a free-for-all, firmly felt to be a “victimless crime” or barely impacting the already-very-wealthy. From this hierarchy of iniquity is forged one of the weapons in the pirate’s self-justification arsenal: “there are heaps of people worse than me.” Playing down the harms and justifying one’s behaviour are profoundly entrenched within the piracy habit and the offender has at his or her disposal a sophisticated entanglement of social, moral and psychological rationalisations. “I’m a content junkie” may be evoked as a reason not to stop, because it’s just too hard to kick the habit. And if “everyone is doing it”, who wants to be the goody-two-shoes loser that misses out on all the fun? With TV shows garnering cult status and (legal) release windows occasionally differing by country or channel, the perceived risk of ‘spoilers’ becomes anxiety-inducing. Those who feel they cannot access shows legitimately believe they face a choice between staying up-to-date through piracy and total buzzkill on the next hit of their favourite shows. Perhaps more importantly, belief in inequity of access to content around the globe – both temporal and financial – is the great moral equaliser in the pirating psyche. Most remain unaware that cost structures and release windows have been brought into line across different markets, and instead hold on to the belief that we in Australia are being held to ransom for access to content. Netflix content differs between countries, for example, does not compute. In a world accustomed to universal, instant access to almost everything, this perceived breach of the most basic precept of information globalisation provides the justification for many acts of piracy. But here’s the biggest disconnect of all: pirates don’t really understand why piracy is wrong. They don’t recall being told, at least, not in a way that they’ve heard, understood and believed. The prevailing messages have been that it’s a crime and not to do it, steeped in admonishing parent-to-child tonality. If we thought it was obvious why piracy is wrong, we need to think again. The irony of the situation is that pirates, the very people who are causing content creators harm, are often among the people who love content the most. But they haven’t joined the dots and made the connection between their actions and a future impact on the quality and quantity of content produced. That we’re dealing with self-confessed addicts and aficionados is the ray of light in an otherwise-bleak outlook. 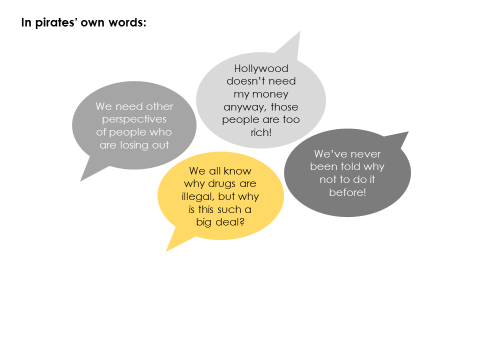 Threats of legal recourse scare some into temporary submission but the lack of follow-through on high-profile cases in Australia (Dallas Buyers’ Club is a case in point) has served to strengthen beliefs that individuals can’t or won’t be prosecuted. Legal retribution will only work as a deterrent if there are real teeth behind it, as has happened in Canada and Germany where rights holder claims against infringers have substantially reduced piracy rates. To achieve successful and sustained behaviour change (in any context), both motivation and facilitation are required. That is, we have to make people want to change and we have to make it easy for them to change. The industry has made significant inroads in making it easy and equitable to access content legally, but motivation to change is the missing piece of the puzzle. What’s needed is to shift the social norms around piracy and that requires educating the public as to why it’s bad for the content creation industry and, ultimately, for them. With rational justification structures so ingrained in the piracy mindset, we need to engage people on an emotional level. We need to have an adult-to-adult conversation about what they love, what threatens it and how we can solve the problem together. 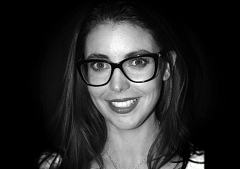 Clare Archer has been a practising market and social researcher for over a decade. In that time she has conducted a wide range of research that seeks to understand behaviours and drive change across a wide range of social issues. She is now a Director at Screen Audience Research Australia (SARA), an independent research organisation that focuses on understanding the way that Australian audiences engage with screen content and media. SARA works with both content creators and marketers in the film and TV industries, at all stages of production, distribution and beyond, using unique methodologies to generate insights that connect industry to audiences.